More than 100,000 sets of Fisher-Price's popular Little People toys are being recalled in the U.S. and Canada because the character Sonya Lee can break and cause youngsters to choke, the U.S. Consumer Product Safety Commission and Health Canada said. The recall affects the Chinese-made Little People Play 'n Go Campsite sold from October 2009 until this month for about $15. If you have the set, remove the Sonya Lee character. A free replacement character can be obtained from Fisher-Price. About 96,000 set were sold in the U.S. and another 14,000 in Canada. 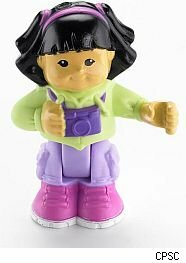 Fisher-Price told the CPSC and Health Canada that the company has received eight reports from consumers of the Sonya Lee figures breaking at the waist. Sonya Lee's name is on the underside of the figure. She is bendable at the waist and is wearing a green sweater and has a purple camera over her neck. 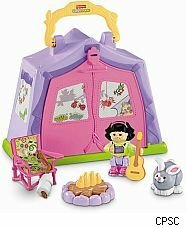 Sonya Lee figures in other sets are not subject to this recall and no other parts of the camping site are being recalled. Fisher-Price at (800) 432-5437 or go to the company's recall site.